We Make the Change, a statewide campaign designed to increase the awareness of HIV/AIDS and its impact on communities throughout Florida, is using art to tell the story of Floridians living with HIV. 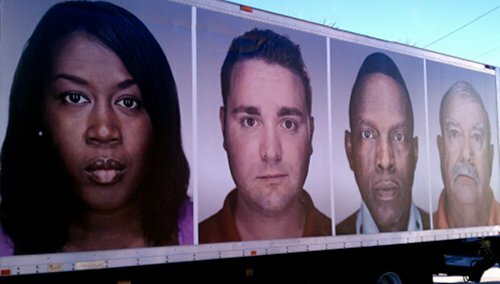 Faces of HIV uses larger-than-life portraits, journal entries and interviews to explore the effects of stigmas, the personal relationships, and care issues associated with being HIV-positive. It’s all part of a mobile art exhibit traveling the state. The exhibit truck takes to the streets today at the Florida State University College of Medicine. The exhibit stops tomorrow at Tallahassee’s Governor’s Square Mall before traveling to Orlando, Miami, Jacksonville, and Tampa later this year. Visit the Faces of HIV website to view photos, read journal entries and see videos from the participants. This entry was posted in Spotlight On and tagged culture builds florida, Faces of HIV, Florida Department of Health, florida division of cultural affairs by culturebuildsflorida. Bookmark the permalink.